About the size of a blueberry, the capsule contains a small needle made of compressed insulin, which is injected after the capsule reaches the stomach. In tests in animals, the researchers showed that they could deliver enough insulin to lower blood sugar to levels comparable to those produced by injections given through skin. They also demonstrated that the device can be adapted to deliver other protein drugs. 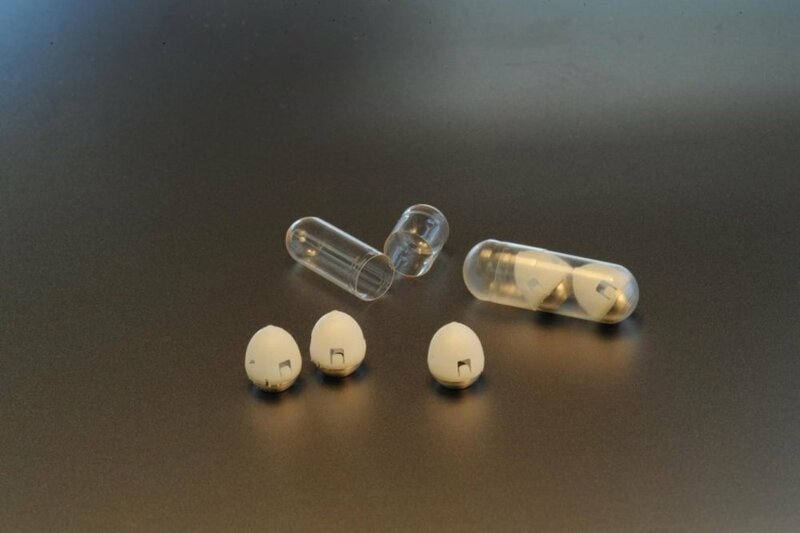 "We are really hopeful that this new type of capsule could someday help diabetic patients and perhaps anyone who requires therapies that can now only be given by injection or infusion," says Robert Langer, the David H. Koch Institute Professor, a member of MIT's Koch Institute for Integrative Cancer Research, and one of the senior authors of the study. Giovanni Traverso, an assistant professor at Brigham and Women's Hospital, Harvard Medical School, and a visiting scientist in MIT's Department of Mechanical Engineering, where he is starting as a faculty member in 2019, is also a senior author of the study. The first author of the paper, which appears in the February 8 issue of Science, is MIT graduate student Alex Abramson. The research team also includes scientists from the pharmaceutical company Novo Nordisk. "As soon as you take it, you want the system to self-right so that you can ensure contact with the tissue," Traverso says. "What's important is that we have the needle in contact with the tissue when it is injected," Abramson says. "Also, if a person were to move around or the stomach were to growl, the device would not move from its preferred orientation." "Our motivation is to make it easier for patients to take medication, particularly medications that require an injection," Traverso says. "The classic one is insulin, but there are many others." The research was funded by Novo Nordisk, the National Institutes of Health, a National Science Foundation Graduate Research Fellowship, Brigham and Women's Hospital, a Viking Olaf Bjork Research Scholarship, and the MIT Undergraduate Research Opportunities Program.